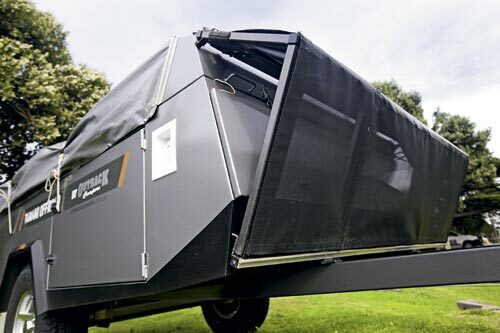 With so many soft-floor camper trailers in the market, it's refreshing to see manufacturers thinking outside the box. 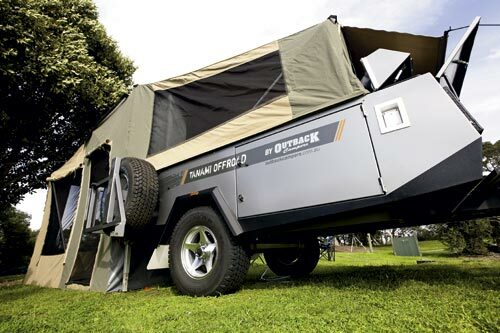 The Tanami Offroad from Aussie trailer and canvas manufacturer Outback Campers is one such example. 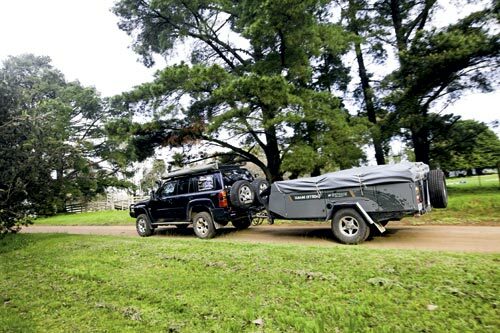 With a body measuring 3050x1850mm (10ft x 6ft) and a wide walk-through, the spacious Tanami includes many clever storage ideas in an easy rear-fold design. Starting up front, the short, curved drawbar runs the full length of the trailer for improved strength. An Ozhitch 3.5t coupling sits up front, accompanied by a jockey wheel, handbrake, Anderson plug and a clever stoneguard that folds forward to provide access to the full-width boot. 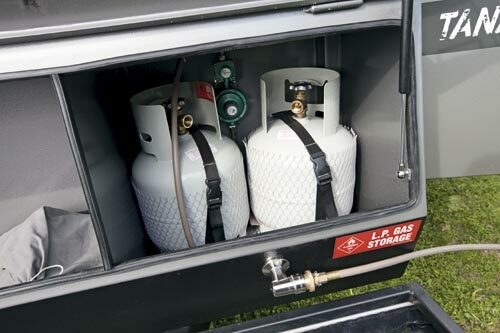 The compartmentalised boot accommodates a gas box, plus a separate area measuring 1300x350x500mm, designed to securely store jerry cans. 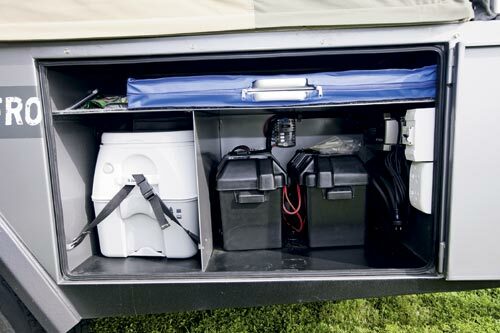 A second full-width boot resides up top, providing a handy area for poles and other longer items. The body is constructed from 1.6mm sheet steel, prime-etched and finished in attractive hammertone grey, with the lower portions wearing a stone-resistant finish. 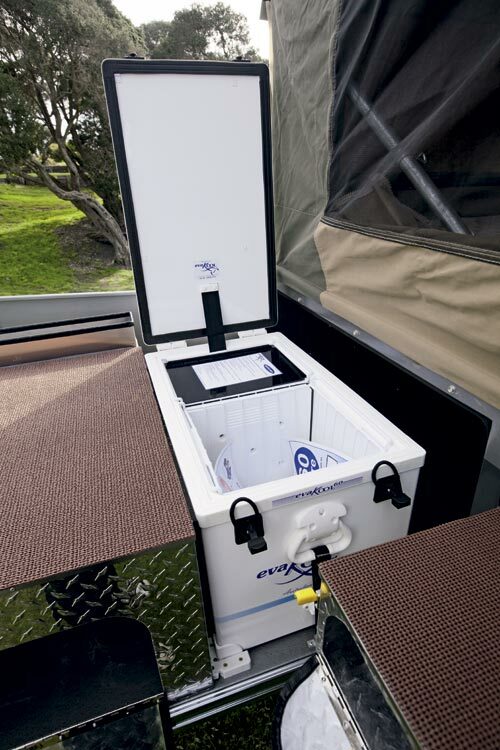 Like many of the other campers in the Outback range, the body is built to the full width of the wheel guards to maximise secure internal storage space. 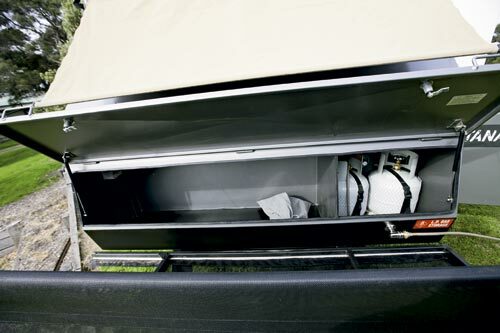 External cupboards and boots are fitted with thick automotive seals and compression locks to keep dust at bay. Dress panels extend below the chassis rails to create a striking point of difference. Underneath, the whole lot rides on Al-Ko independent torsion bar suspension (rated to 1600kg), 15in wheels and 12in electric drums, which provide plenty of stopping power. 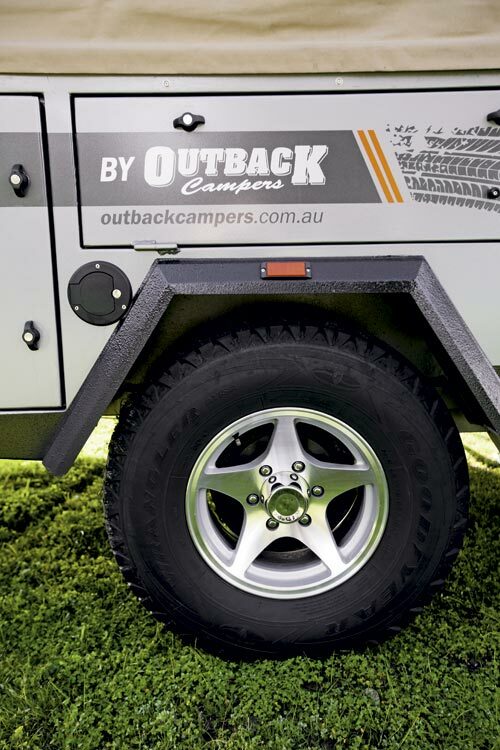 Outback has used Al-Ko independent suspension on its hire trailers for many years and, with fewer moving parts than standard suspension systems, it does the job with a minimum of fuss. Wiring and plumbing is neatly tucked away from flying rubble, as is the 120L water tank. At the rear, LED running lights within bright chrome dress rings take care of business. 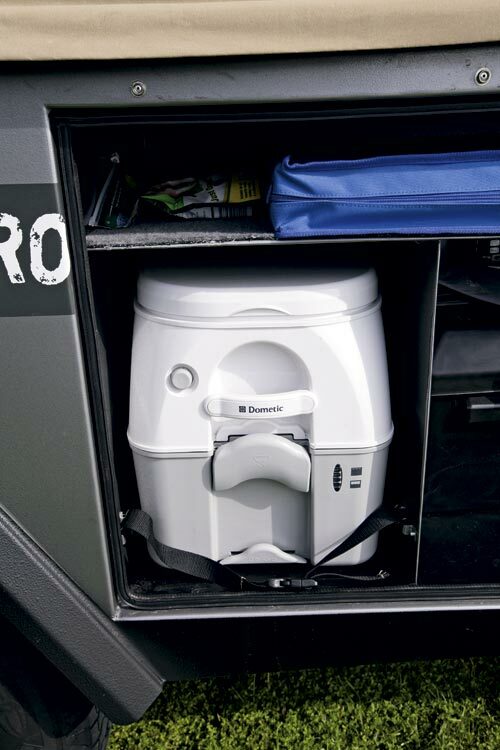 A sturdy dual-hinge wheel carrier swings out 270°°to rest parallel with the body on the offside, while the front cupboard houses electrical and utility items, including compartments for an Evakool 100W suitcase solar pack, porta-pottie and all electrics, the latter including dual battery boxes, Ctek 25A charger, fuse box, circuit breaker and dual 240V outlet. On the nearside, the slide-out kitchen extends from the front cupboard. 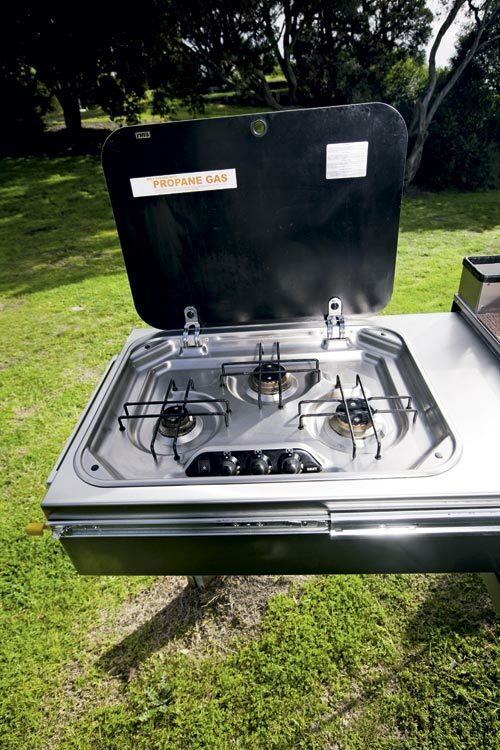 The kitchen features stainless steel tops and shiny aluminium tread plate sides to save weight. A 60L Evakool fridge/freezer is fitted on the slide-out closest to the body, a large preparation area sits in the middle, and a three-burner Smev cooktop slides from the end compartment. Cupboard space fills the remaining areas, accessible from either side. 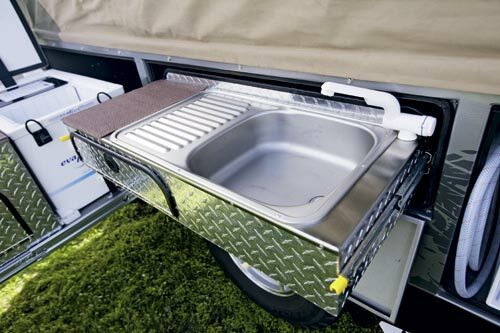 Still on the nearside, a cupboard over the wheel arch folds down to reveal the sink slide-out: a small area featuring a stainless steel sink, drying area, under-sink storage and 12V water. A simple hose arrangement with a snap-on connector directs waste water to a desired location. Working well as part of the kitchen layout, with a fridge, stove and preparation area, the rear nearside compartment also features a six-drawer pantry box, ideal for kitchen consumables. While shiny tread-plate aluminium used on the kitchen saves weight, it does detract from the overall appearance. Personally, I prefer the understated look of powder-coat or stainless steel. Like the other design considerations, the setup process has been well thought out and can be performed by one person, as I was shown. 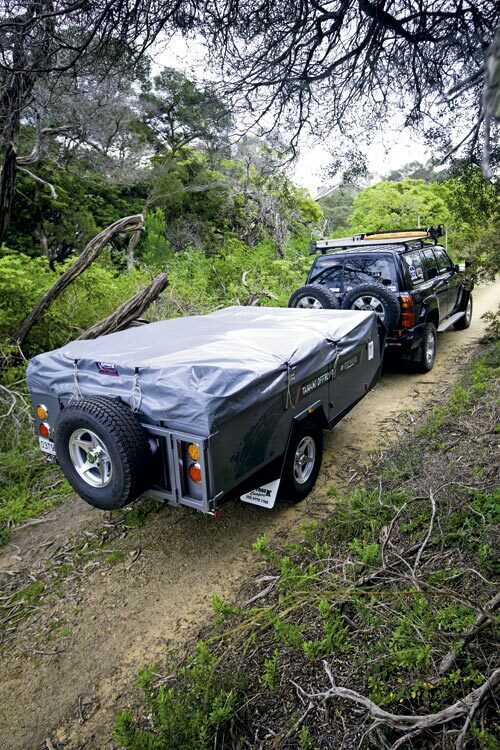 To execute, roll the heavy-duty travel cover forward and push the second bow towards the rear of the camper. The gas struts then kick in and the other bows cascade forward. Peg down the floor, step inside and adjust the bows and the job is done. An awning is provided with optional walls to cover the kitchen. 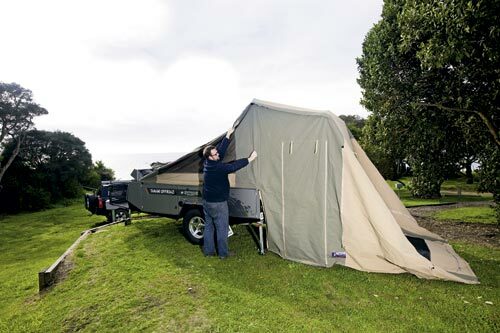 The tent is made from quality Australian-made 10oz Bradmill Superdux canvas; khaki and beige walls and a beige top are offered as standard because they dry quickly and absorb little heat, but Outback does its own canvas work on-site, so you can choose from a range of colours. 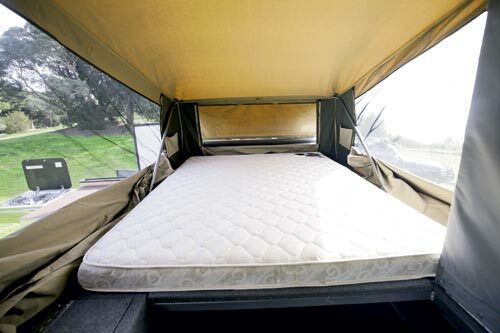 The tent section incorporates some of the biggest windows I've ever seen around the queen-size mattress, offering excellent ventilation in warmer climates. The flywire is a special-order item which stops most common flying insects, but still offers good airflow - it's a much better compromise than the usual fine insect mesh. 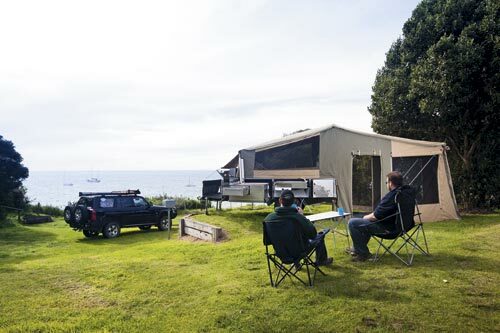 A weather-proof drawbar awning keeps all but horizontal weather at bay while still maintaining privacy. 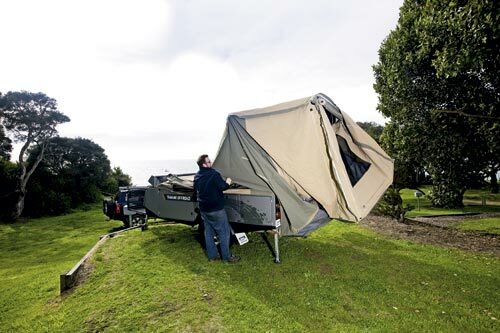 A toilet tent is assembled within a metre of the camper with a zip-on roof and there is an optional kids' room, which zips onto the rear of the camper. Stepping inside reveals a raft of cunning storage ideas. 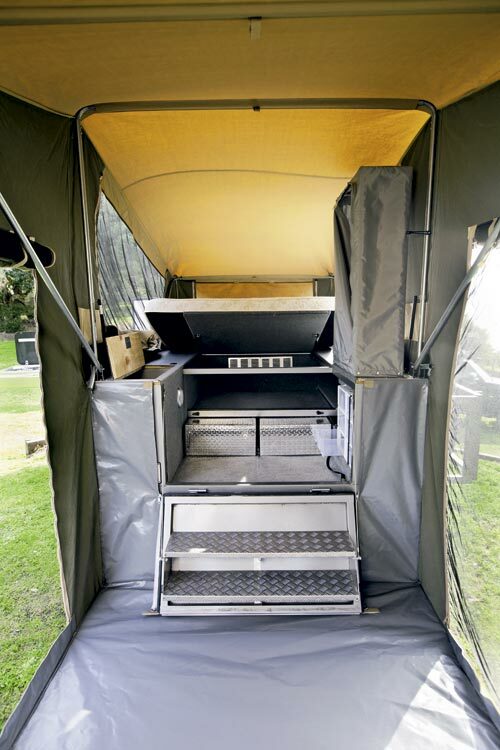 The tailgate folds down to form two wide steps, supported by wire stays. 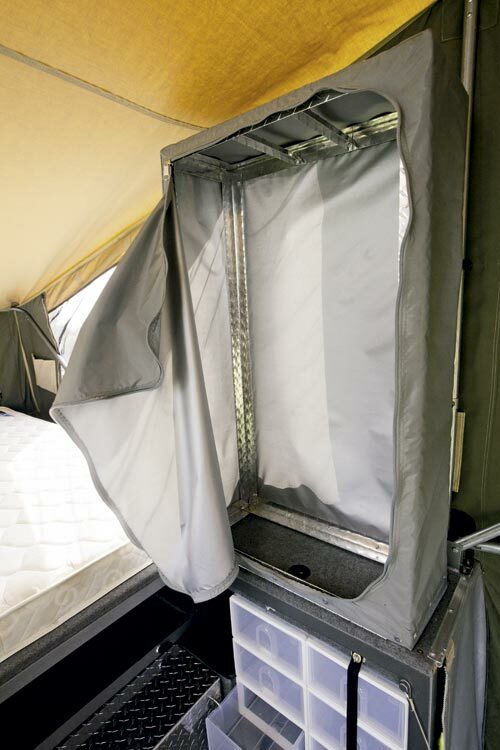 A light-duty hinged storage wardrobe constructed of angle aluminium and covered in a zipped nylon outer is stored horizontally in transit, but is pivoted upright when in camp, providing a clever hanging area on the right-hand side. 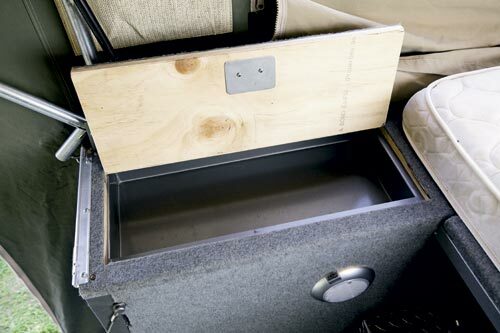 Below the wardrobe is another six-drawer storage unit, ideal for socks and jocks. 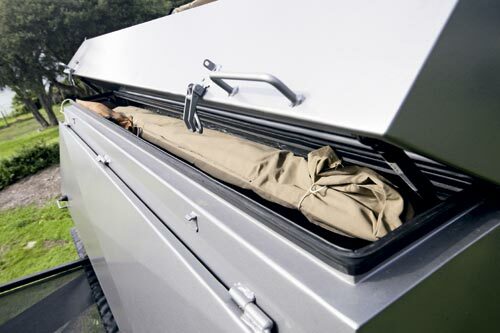 Doubling as an additional step up to the bed, two aluminium boxes roll forward on runners to reveal twin deep drawers, great for clothes. 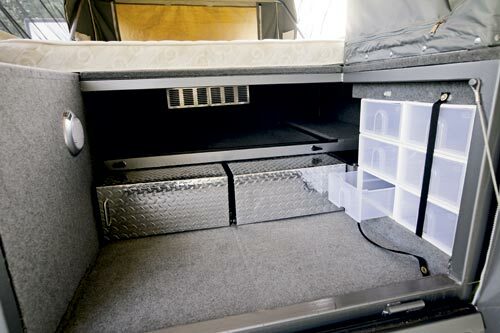 A further cavernous storage space, lined with carpet, is found above the drawers - just lift the bed with the assistance of gas struts to gain better access. An interior LED light glows over the foot well, but otherwise no additional interior or exterior lights are offered. With the relatively short drawbar and compliant independent suspension, the Tanami tows well on or off the tarmac, without chopping corners. 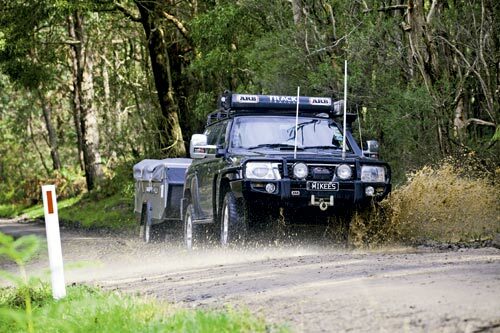 The independent suspension performs best with some weight aboard, but considering many of us tour with a full tank of water, food, clothes and often with jerry cans, this shouldn't be an issue. 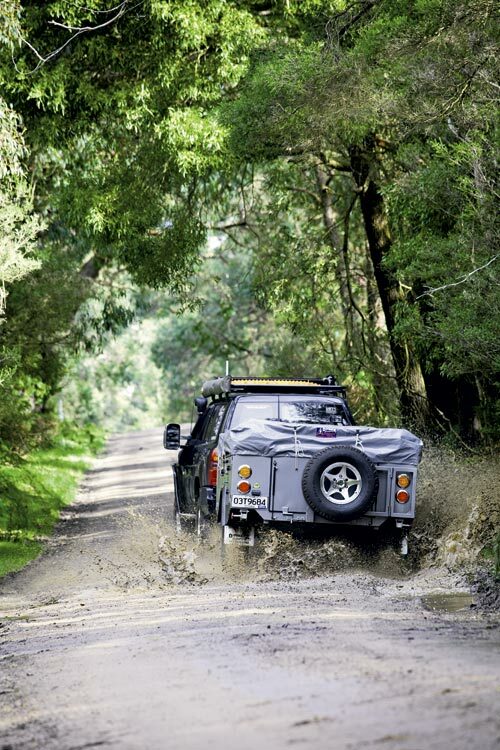 There is plenty to like about the Tanami Offroad. 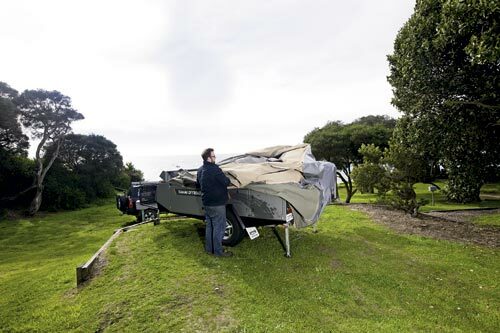 Outback has used its 20-plus years in building and hiring camper trailers and 40-years in canvas production to come up with something special. Not only does it look good, but the clever design delivers a capable touring or weekend package that ticks all the boxes. 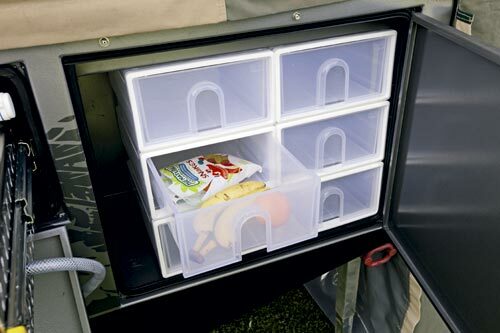 The storage options are comprehensive and the kitchen is bigger than most. 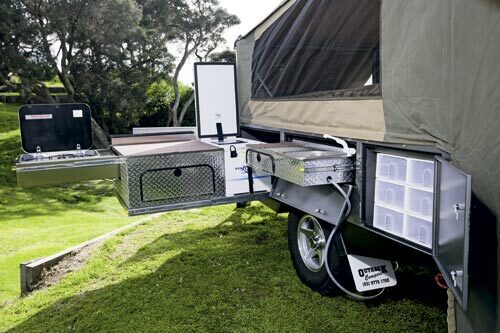 Designed and manufactured in Australia to suit local conditions, just add some portable lighting and you have a recipe for a terrific family camper that's up for just about anything. 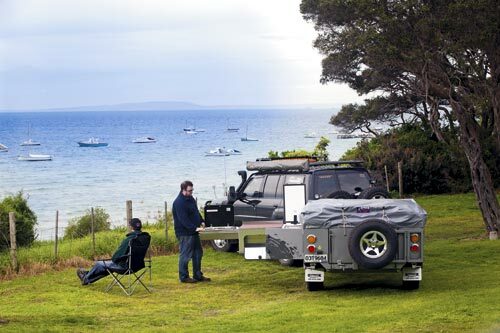 Find Outback Camper Trailers for sale. 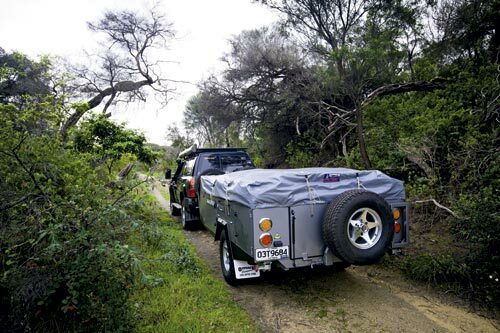 Search for new Outback Camper Trailers.